JAPANESE art had a profound influence on artists and designers in Europe during the latter part of the 19th century as Japan, which had been isolated from the outside world, began to open its ports to foreign trade. The current exhibition at the Caixa Forum in Madrid is the first exhibition in Spain dedicated to what has become known as Japonisme and has been organised in collaboration with the Museu Nacional d’Art de Catalunya. Around 300 works of art, paintings, prints, illustrated books, porcelain, textiles, vases, sculptures, folding screens, jewellery and furniture, dating from the 17th century, are on display. Although there had been a growing interest in oriental art since the 17th century, it was the decision by the Japanese to participate in the Paris World Fair in 1867 which brought Japanese art to the attention of Europeans. The delegation was led by 14-year-old Tokugawa Akitake, the younger brother of the last Shogun. While in Paris his portrait was taken by French artist, James Tissot, the first by a European artist. The watercolour on a hanging scroll on show in the exhibition belongs to the Tokugawa museum in Mito. 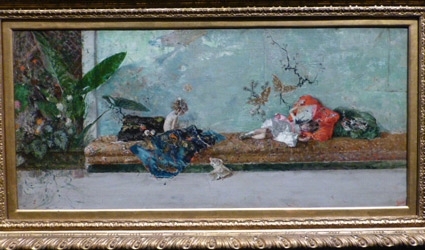 The Japanese followed up their success in Paris by attending the World’s Fair in Barcelona in 1888 and a network of shops specialising in oriental art and decor opened in Barcelona, making Catalonia the most important centre for Japanese art in Spain, attracting both artists and collectors. Japanese art became an international phenomenon influencing artists and designers with its aesthetic approach, graceful nature, delicate finish, compositions, treatment of perspectives, colours, textures, formats and use of lacquer. European artists were captivated by the Ukiyo-e woodblock prints from the Edo period, modern day Tokyo, dating from the late 17th and early 18th century. The meaning of ‘Ukiyo-e’ is a ‘floating world’ and this concept influenced and transformed European art at the end of the 19th and beginning of the 20th century. The artists, Hokusai, Hiroshige and Utamaro became as well known in Europe as they were in Japan. Their art inspired the impressionist movement, clearly evident in many of the works of Monet, Van Gogh, Toulouse Lautrec and James McNeill Whistler. Spanish artists such as Camarasa, Fortuny, Guiard, Rusinol, Sorolla and Villegas also adapted their styles to Japonisme. Mariano Fortuny was considered the first ‘Japonista’ in Spain and many of his works have a distinct Japanese flavour with the use of flowers, colours, furniture and objects in his works. His painting ‘The artist’s children in a Japanese salon’ shows his use of Japanese techniques. The exhibition commemorates the 400 years of Japan’s ties with Spain since Date Masamune, the ruler of Sendai first established diplomatic relations. “This is not just the first exhibition of its kind in Spain but the first to show how Japanese art took root in Spain, especially in Catalonia,” said curator Ricard Bru i Turell.